-- First of all, we both like the city far, far more than we were expecting to. (Then again, our expectations were pretty low). We have spent most of our time walking the streets or riding the rivers in between seeing temples and palaces or shopping, and it just doesn't feel like a city of 6 million people. It helps that our hotel (New World Lodge Hotel, no where near as fancy as this makes it look) is on a little canal, away from the commercial nightmare that is Khao San Road (the budget tourist/backpacker capital of the city) and far away from the ritzy commerce of the area around all the upscale hotels (The Oriental, Shangri-La, etc.). -- We are captivated and fascinated by the markets lining the streets, especially all the food vendors. Walking down the street you pass by cart after cart with exotic looking fruits and soups and meats and noodles, and catch whiff after whiff....some familiar, some strange, some drool-inducing, some repulsive...and the sheer number and variety just makes your head spin. That more than anything has probably given me the "I guess we're not in Kansas anymore" feeling. It's like walking through a postcard or documentary. -- While we haven't eaten anything off of the street carts yet, I have no doubt that we will. (Though we will choose carefully to try to avoid paying for it later.) Actually, our culinary adventures have been a huge success so far. While we haven't quite made it to the street vendor stage, we have stayed far away from any restaurant aimed primarily at tourists. Ironically while we have been following some of Lonely Planet's recommendation, we have seen very few other westerners at the restaurants. But the recommendations have been good ones as most places have been packed with Thais, with tables spilling out down the sidewalk. Our favorite local dive (Jeh Hoy, on Th Samsen) is actually an open air restaurant, with the kitchen outside on the street corner and the woks and knives flying constantly. We've pretty much loved everything we've eaten and most dinners have been under $6 (for both of us). After wincing each time we paid for food in Scandinavia, this is more like it. -- One of the things I like the most about being here is the friendliness of the people and the fact that when you are walking down the street and you smile at somebody, they smile back. I hadn't realized how much I had been missing that.... Plus we have gotten lots of smiles and giggles from out attempts to speak a (very little) Thai and to wai (bow with hands folded) at the right moments. Hopefully in the coming weeks we'll be able to add a few more words to the vocabulary. -- Of course, the Thai reputation for friendliness is also a downside, because it makes it very hard to figure out whether somebody is genuinely being friendly, or is trying to scam you. I think as we get farther into rural areas, the ratio will fall shift firmly into the genuine category, but for the moment over half the people who approach us are actually trying to con us into going on a tour with them, taking their tuk-tuk to destinations unknown or buying something... We're trying hard not to let it turn us cynical, but it does get old at times. -- We have of course gone to many of the requisite places and seen the first set of what I'm sure will be many, many, many exquisite temples. Favorite sights and moments so far...appreciating the detail and decoration on the building housing the emerald buddha, being impressed by the sheer size of the giant reclining buddha (finally, someone with bigger feet than Brian! ), getting a better sense of the king and royal family walking through an exhibit of the king's personal photography, and sitting at the back of a temple soaking in the ambiance as 30 monks chanted their evening prayers. -- One of the more interesting cultural items has been learning and experiencing how reverent the Thais are about the monarchy. We had read that saying bad things about him can be a criminal (and in fact jailable) offence, but we weren't prepared for the pictures of him everywhere: shopfronts, intersections, schools, office buildings, ATM machines, etc. And these aren't small framed pics on the wall, like you often see other places, these are billboard-sized photos dominating the landscape. We have also caught a glimpse of this national reverence at 6 pm on a few of the days. At this time, everything stops and the national anthem is played (at concerts, events, movies, on the street, etc). Once we were out walking and heard the music and noticed that people at the bus stop had all stood up so we stopped and stood too, and then last night we were actually watching a football match on tv and it broke into the programming to play the anthem, complete with patriotic images and the words scrolling across the bottom (all that was missing was the little bouncing ball). -- Finally, our shopping woes continue. After 6 months of wearing almost the same things every day our clothing is growing a little ragged. So we have been trying to replace a couple of items for a while. In Europe the last 3 months we struck out because we were looking for warm weather clothing (short sleeves, etc.) and shops there were all full of winter gear. Now here we are finding more weather-appropriate clothing, but now we're running into the problem of size, as Brian's head and feet and my general body are a little bigger than your average Thai. Sigh.... Wish us luck! 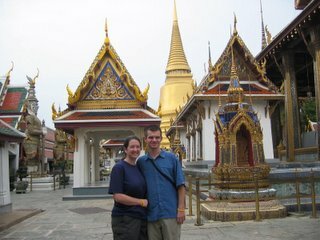 Tomorrow we head north to Sukhothai and Phitsanulok for a few days and then will continue up to Chiang Mai. By the way, a few days ago was the six month mark since we landed in Belgium to begin this adventure.....wow. Still going strong, though. - If you go to see a movie... it starts with everyone rising and singing the national anthem while photos of the king scroll on the screen. Chiang Mai is certainly on the menu... Our dinner cost tonight? $1.50!